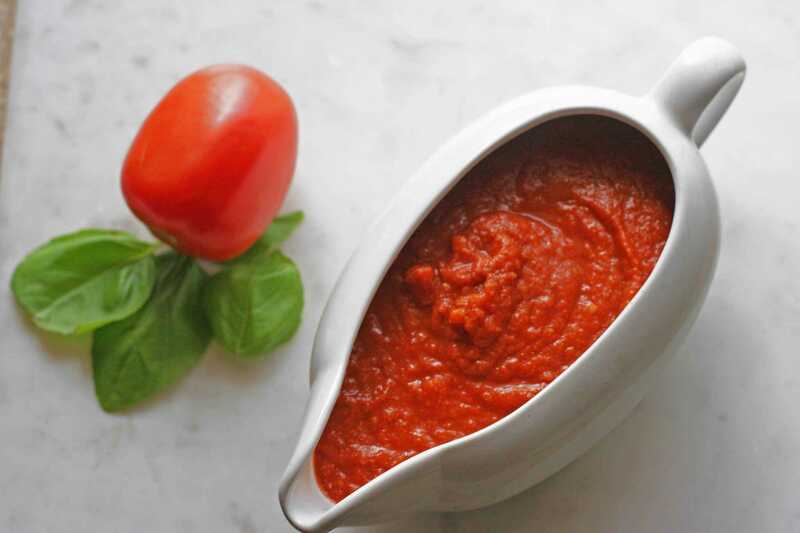 Homemade Classic Marinara Sauce is a classic Italian tomato sauce! I grew up on eating this traditional sauce on everything from pasta, chicken, lasagne, and ziti! So much better than any store-bought jarred sauce. All natural! gluten-free, low-calorie, low-fat, paleo, whole30! Homemade Classic Marinara Sauce! Seriously one of the most delicious sauces around! This is one of my favorite sauces ever to prepare! I love to take a little time to myself and do a power freezer cooking day. I will have to share that type of day on the blog very soon! This Classic Marinara Sauce is one of those recipes and I have been making this sauce since I was probably 17! It is just a family favorite and it is so versatile! I love to triple or even quadruple this recipe to always have marinara sauce at the ready! I have to always make extra because the hubs always steal a few scoops, okay a huge bowl of the sauce before it is even out of the saucepan and dips warm Italian bread into the marinara! It is addicting! Seriously, we will be friends forever after you make this! Yup, forever! I am going to say that if you are a jar sauce person, I am no snob to a jar sauce! 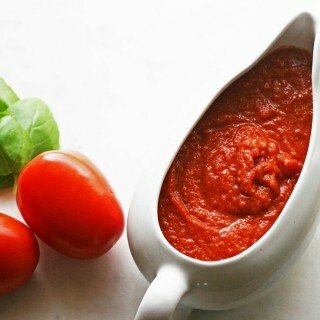 There are definitely some really delicious jarred marinara sauces out there and I have enjoyed using them! I use fresh garlic, onion, carrots, celery, and basil in this sauce which adds great flavor to the sauce. Use a really good canned tomato like San Marzano also makes my taste buds tingle. Don’t skimp on those tomatoes, you won’t be disappointed. This is my longer version of marinara sauce because I let it simmer for about an hour to really combine the flavors. Puree all the ingredients and oh my goodness, super delicious! Make a triple batch. This sauce freezes really well! WHEN YOU MAKE THIS SAUCE, SHARE A PHOTO ON INSTAGRAM, TAG #EVERYDAYEILEEN. I LOVE SEEING AND SHARING YOUR CREATIONS! ANY QUESTIONS OR COMMENTS, USE THE COMMENT SECTION BELOW! If you enjoyed the recipe, it really helps me if you can rate the recipe! 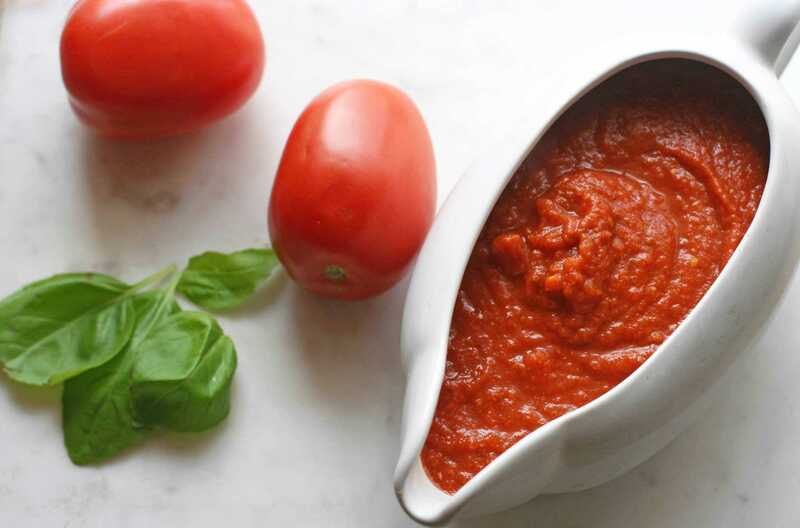 A slow simmered marinara sauce full of flavors from garlic, carrots, celery, onion, and San Marzano tomatoes. This sauce is wonderful to make in bulk and freeze extras for quick meals. Fantastic over pasta, spaghetti squash, chicken parm! Endless possibilities! In a saucepan, over medium heat, add olive oil. 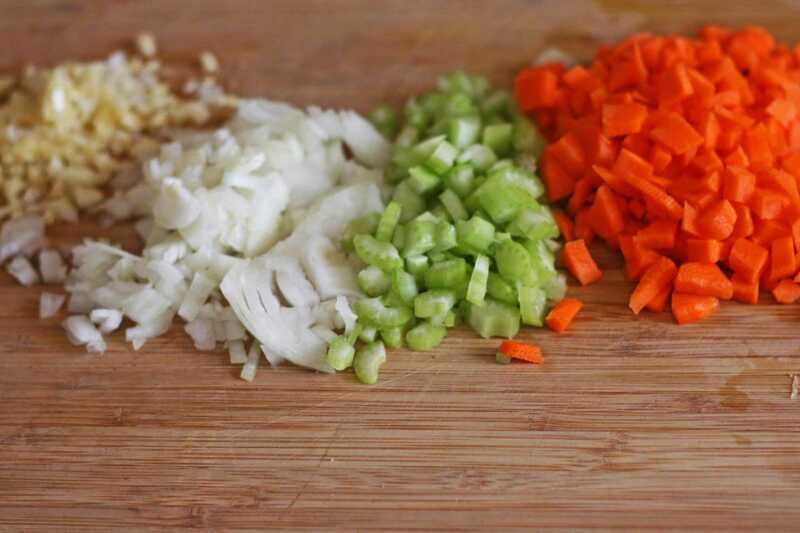 Add minced garlic, onion, carrot, and celery. Saute for about 5 minutes to soften the vegetables. Add the San Marzano tomatoes, fresh basil, dried oregano, dried parsley, ground fennel, dried bay leaf, salt, and pepper. Reduce heat to low, cover pot and simmer for an hour. The sauce will thicken. Remove the bay leaf. Using an immersion blender, blend the marinara sauce until smooth about 2 minutes. Check the seasoning and seasoning, if needed. Sauce is ready to serve. Can be refrigerated for 2 days. Can freeze for 3 months in 1 gallon freezer bags. I make a triple batch and freeze the sauce in 1-quart freezer bags to use for the month. Awesome meal prep to use in other meals like pasta, eggplant, and spaghetti squash. My favorite sauce! Just like my Mom;s! That is awesome Kerri! I am so glad you enjoy! I’ve never made my own marinara sauce actually but this one looks fantastic! I need to try it with some garlic bread for sure. My hubbie eats this marinara sauce with garlic bread all the time – yummy! I have made my own with chilli’s, garlic, tomatoes and peppers and it is delicious. I love your Marina recipe it looks so tasty! This looks amazing! I love an incredible marinara! I am going to have to try this one out very soon! I had an ex who used to make his own sauce and it tasted so delicious. This recipe really inspires me to try to make my own. You don’t need the ex! 🙂 Make this yourself and you wont buy too many jarred sauces again ! Great photography! This sounds easy and delicious. I am Italian so for me to be impressed with a marinara sauce says something. 🙂 This one looks amazing and I can’t wait to try it! Vicky, you have made my day! I hope you send me a pic and a critique when you make this. Yum.I always love making sauces. Marinara though I’ve never really been able to be good at so my husband usually does it. This looks wonderful. It’s always refreshing to see recipe using fresh ingredients. This maranara goes around perfectly with any type of tomato-based pasta, or pizza. Lovely photos, too. A must try recipe for me. My kids and I love sphagetti so I try making pasta sauces at home but this looks simple and bowl licking worthy! I love a good marinara sauce! I never thought to make a batch to freeze! What a great idea! 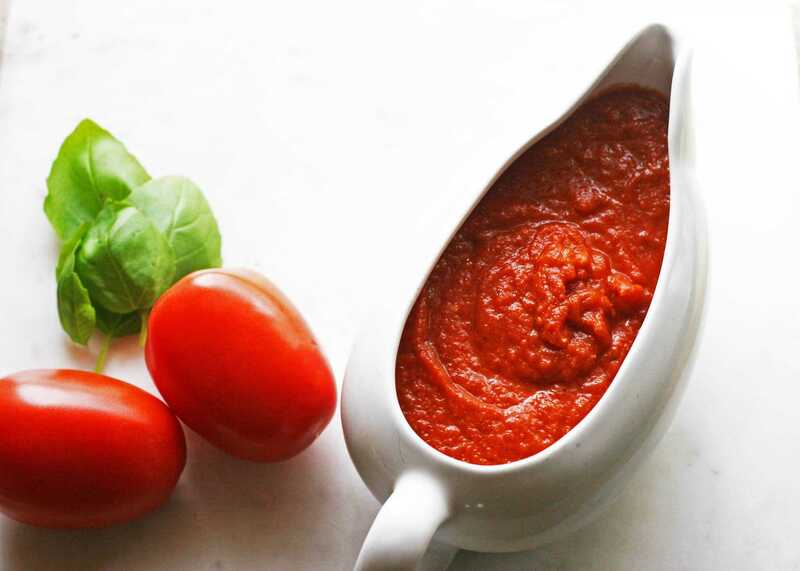 Marinara sauce is one of my most often batch cooked recipes. The family loves it and it works with so many different recipes. I love recipes that are made with simple ingredients I usually have on hand but then are AMAZING!! This looks like one of those!! I would love to try this sauce! I bet my kiddos would love this! I’ve never tried making my own marinara sauce. Funny how the recipe uses a lot of the ingredients I already have at home. I’ll have to give this a try. Ooh this looks yum! Would love to make this, looks really simple! I never make my own sauce, but you inspired me! I am so glad! I hope you try this recipe. Easy and tasty! This really looks amazing – I have to try making my own marinara! We make homemade pizza every Friday evening. I bet if I let this simmer and thicken a bit, it would make great pizza sauce. Thanks for sharing the recipe! that would be awesome. Maybe a little more tomato paste to thicken for pizza sauce.